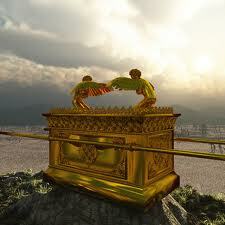 The Biblical World: The Ark of the Covenant has been discovered! In Greece! Is your country broke? Create a demand for tourism! Didn't Ron Wyatt find the Ark beneath Golgotha? Yes I believe Ron Wyatt did! The Ark is resting under the place of the crucifiction. As the people of old had to sprinkle the blood of the sacrifice on the ark for redemption of sins, so Jesus's blood had to fall on the Ark for redemption of sin. I am surprised that no-one has picked this up. The sacrificial lamb that was sacrificed in the Old Testament was but a foreshadow of the "Lamb of God"
Another false claim.... if he has it, he needs to show it... This is all speculation until the ark is produced and visibly scene. Since the Ethiopians claim to have it also.... present it!! It's under Jeremiah's Grotto, place of Christ's crucifixion and the reason it hasn't been taken out is because it's impossible to get close to something that HOLY, no less take a picture of it. No one announced it's official discovery, why? Ask the question of why is it the Palestinians are really fighting over Israeli land. Plus, it would cause war at the wrong time. I'm agree with the last two posters. Ron Wyatt discovered it and has a valid and true testimony concerning it's placement and location. It only makes sense to be where it is currently, under the place of the crucifixion. The Ark is with Father - not here on earth. And when you have multiplied and been fruitful in the land, in those days, declares the LORD, they shall no more say, “The ark of the covenant of the LORD.” It shall not come to mind or be remembered or missed; it shall not be made again." Also... the real Ark of the Covenant is in heaven, with the Lord. The one made here on earth was only a copy of the one in heaven. Have you forgotten that the ark of the covenant and all the priestly infrastructures of Moses' time was but a copy of the great original pattern shown by Yahweh to Moses on the mount? See Exodus 25:40. In qouting Revelation, you are out of context, because the earthly pattern was NOT taken to heaven with the Father, as you supposed. There is an Ark in heaven, the original one, of which, the Ark of Moses's time was only a copy...discovered honestly by Mr. Wyatt.. After this comment of yours, do you have any discoveries to show? Ron Wyatt is a proven fraud. It saddens me to see people actually believe in his fake discoveries. and i don't believe in you fake comments either. Wyatt had proven more than enough. Your comment is a proven fraud. the Ark of the New Covenant WAS under the cross, and sprinkled with the blood of the lamb, it was the Virgin Mary. The Ark of the Old Testament is in the desert, perhaps Sanai, where there are only a handful of guardians who know it's exact location, and where it stays for now, because the world is not ready for it. Yet. Yep, the Virgin Mary is the arc of the new covenant. Ding Ding Ding! Finally someone who knows the truth. Amen! it was the Virgin Mary-What's that supposed to mean.. Sorry- Mary died and anyone who worships her is lost..
2. You shall not make yourself any graven image [to worship it] or any likeness of anything that is in the heavens above, or that is in the earth beneath, or that is in the water under the earth; You shall not bow down yourself to them or serve them; for I the Lord your God am a jealous God, visiting the iniquity of the fathers upon the children to the third and fourth generation of those who hate Me, But showing mercy and steadfast love to a thousand generations of those who love Me and keep My commandments. 3. You shall not use or repeat the name of the Lord your God in vain [that is, lightly or frivolously, in false affirmations or profanely]; for the Lord will not hold him guiltless who takes His name in vain. 4. [Earnestly] remember the Sabbath day, to keep it holy (withdrawn from common employment and dedicated to God). Six days you shall labor and do all your work, But the seventh day is a Sabbath to the Lord your God; in it you shall not do any work, you, or your son, your daughter, your manservant, your maidservant, your domestic animals, or the sojourner within your gates. For in six days the Lord made the heavens and the earth, the sea, and all that is in them, and rested the seventh day. That is why the Lord blessed the Sabbath day and hallowed it [set it apart for His purposes]. 5. Regard (treat with honor, due obedience, and courtesy) your father and mother, that your days may be long in the land the Lord your God gives you. 9. You shall not witness falsely against your neighbor. 10. You shall not covet your neighbor's house, your neighbor's wife, or his manservant, or his maidservant, or his ox, or his donkey, or anything that is your neighbor's. I agree, all those who worship Mary and say the Hail Mary's are lost! Before the bible was even canonized and made whole into one text...the writings of the first church of Christ 200 years before this canonization of the bible even happened would disagree. Mary was referred to as "The Ark" in historical documents that were used heavily in the decision making process as to what was inspired Word of God and what was not. Amen! Why do people worship dead people? She is a woman who loved the Lord,thats why she was choosen. Imagine her face in complete shock and udder horror over man worshipping her and NOT HER SON! THE WHOLE REASON FOR HER EXISTENCE! He died for us. She did not. So you're a disciple of Zecharia Sitchin? He was the one who made interpretations of ancient summerian artifacts about the epic of Annuaki. His research made it appear that our Bible was not the original ancient account, but that there is still another story about the gods more ancient to Moses' account. Well, of course I don't believe his interpretations because no matter how expert he was in archeology, He did not exist in ancient time to know exactly the meaning of symbolisms in their literature. Neither do i trust his findings much less his translations or interpretations. Did i not said that he wasn't born in the ancient times to read their letters? And ughh,, I still find it logical and scientific to believe the Bible. I don't care the hell skeptics and hopeless atheists say. The Babylonians carried off the implements of the temple when they destroyed Jerusalem, and Solomon's Temple, and took the tribe of Judah into captivity in 586 BC. When Cyrus the Great allowed the first Jews to return in 536 BC and rebuild the Temple, this would have been the 2nd Temple, he gave them a few implements for the temple. Tradition says that the prophet Jeremiah hid the ark in a cave at Mt. Nebo before the Babylonian captivity, and that its location would not be revealed until God is ready to reveal it. After the Babyloninan captivity the Ark of the Covenant fell off the pages of the Bible, and nothing more is said of it. God is always in the process of salvation, and the Ark was being phased out to make way for Jesus. As an artifact, though, it would be priceless. It's all going to happen real soon. Israel is saying that Iran will have 5 nukes by April 2012. So that means that they will attack in the next 4 months. Bring out the ark! It doesn't matter if the Ark has been discovered or if it ever will. God's Presence isn't there anymore. It is in those who have accepted His Son, Yeshua, as personal Savior and Lord. I can't imagine that it would be much more than dust if it were ever found anyway. It does matter, for the purpose of confirming our faith, and as means of conversion among the Israelis who do not yet believe. Ron Wyatt in his research had led many to accept Christ as the Saviour. . Yes, you have the point, God's presence isn't there anymore. But the Shekinah must be revealed in the lives of His children on earth, not anymore in buildings and structures. Hey I heard Geraldo Rivera was going to reveal it when he opens the real tomb of Jesus Christ. Anonymous has said a lot of confusing and contradictory things in this post. They found the Ark of the Covenant in a cave under Golgotha. God knows where it is....He will allow the bringing forth of it when He is ready. It is exciting and joyful to think we know where it is. That's what is great about the Bible. We KNOW it all happened and we want to piece the history of it together so that it can be tangible...but with most things we have to have FAITH that what is in the Bible is true and will come to pass as God as planned it. this ark is a copy like the one in Etheopia. The true ark was discovered in a cave just outside the old city wall in Jerusalem. Has nobody every read 2 Macc 2? Wow, Luther really did a number on you people. I just read the discovery made by Ron Wyatt and i gotta say its an amazing discovery and i believe that his discovery of the the ark of the covenant is not false but true.... I believe God will allow the ark of the covenant to be viewed worldwide by the people when the time is right... we just got to be patient. The Ark of covenant is hidden in England! believe it or not! The Ron Wyatt account of the Ark is true people as several folk have mentioned here. In time it will be visible to the entire world - after the mark of the beast has been forced on the people. They found the Ark of the Covenant! Christ tomb, Crucifixion site and the Ark of the Covenant found buried under a trash pile at the foot of Skull Mountain.